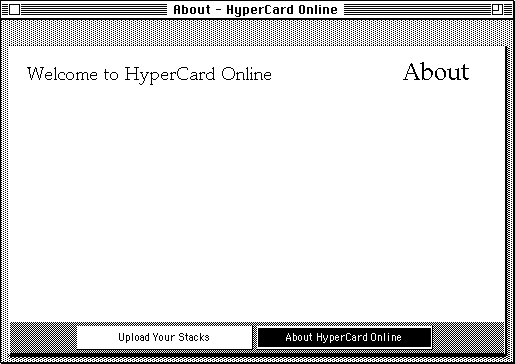 HyperCard Online is a way of getting your HyperCard stacks up and running online. Simply upload a stack in a Stuffit Expander-compatible file (.sit, .sea, .hqx, etc..), a Macintosh Disk Image, or a raw HyperCard stack, along with some basic information such as the name, author and a description of the stack. Behind the scenes, your stack will be uploaded to the Internet Archive, where it can be run in a web browser.